First Line: Environmental activist David Greenbriar climbed steadily higher onto the Kaiparowits Plateau, unaware that this would be his last sojourn into Utah's southern wilderness. Kanab, Utah is divided by one topic: land management. On one side are those who want federal lands to be opened for ranching, recreation, and the creation of jobs (mining, etc.). On the other side are those who want these delicate ecosystems closely monitored and protected. Recently arrived from Denver where he was a homicide detective, J.D. Books has returned to his Kanab roots as the first Bureau of Land Management Law Enforcement Ranger in the area. When environmentalist David Greenbriar is found dead, Kane County Sheriff Charley Sutter asks for help from Books. Without too much digging, Books discovers that Greenbriar's wife has been having an affair with Lance Clayburn, and physical evidence links Clayburn to the killing. Everyone else is ready to stamp PAID on the case, but Books keeps digging. When he turns up information that leads to a Las Vegas business conglomerate with ties to organized crime, he knows that the investigation is anything but over. 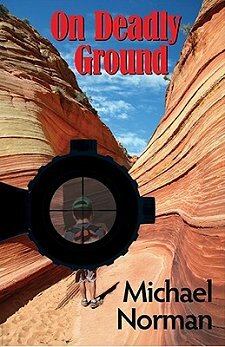 Author Michael Norman has a strong background in law enforcement and criminal justice, and it certainly shows in On Deadly Ground. Books is a tireless investigator, and the Bureau of Land Management is fortunate to have someone with his expertise. Although the book skates perilously close to the cliched "blind" local police, Norman serves up a welcome surprise. In fact, that wasn't the only welcome surprise in this book. The killer is one scary guy that actually made me nervous. In addition, the cast of characters is an interesting bunch, and-- along with Books himself-- I'm looking forward to getting to know them better as the series progresses. I'm also looking forward to learning more about southern Utah. It's an area that's beautiful and remote, and I'm certain it's filled with enough investigations to keep J.D. Books occupied (and readers entertained) for a good long time to come. On Deadly Ground at Amazon. On Deadly Ground at The Book Depository. On Deadly Ground at Your Favorite Indie Bookseller. oh, #1 in a series! and an interesting setting. and a scary killer...sounds like it has a bit going for it. A new to me author and new series. I always like a southwest setting and a really creepy bad guy. I go out of my way to search for mysteries set in the Southwest (especially Arizona), and I'm glad I found this one! Cathy - I really like the setting of this novel, and hooray!! for an author who uses her or his background to give readers a sense that a story is authentic. I'm not crazy about the "blind local police" element, but if that didn't take you out of the book too much, this sounds like a good raed. No, it didn't take me out of the story-- and I really liked the way Norman took care of that. It is a good read! Haven't heard of this book before, or the author for that matter. It sounds like my kind of read so I'm adding it to my list.